Scholastica announces the release of “Democratizing Academic Journals: Technology, Services, and Open Access,” a free-to-read white paper. Get your copy here. It’s time for a 21st-century solution to the serials crisis that gives scholars the freedom to choose where to publish their research and how much it should cost. 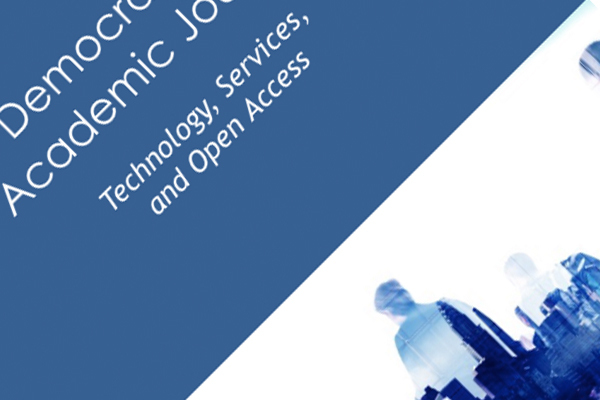 Scholastica’s white paper, “Democratizing Academic Journals: Technology, Services, and Open Access“ argues democratization of journal publishing is the key to lowering journal costs and facilitating open access (OA). Members of the academic community, either in not-for-profit organizations or informal groups, must break up the corporate publisher conglomerate by using technology and services to affordably publish journals on their own. Today corporate publishers control the majority market share of academic journals and are exacting exorbitant fees for journals putting libraries at risk of losing access to research. For years, the academic community has been trying to work with corporate publishers to make journals more affordable, but the corporate publisher stronghold of the market has made it virtually impossible. In addition to controlling the majority of journals, corporate publishers have large concentrations of titles with high impact factor, which scholars seek to publish in and cite due to perceived prestige. Since scholars can generally only publish their articles in a single journal, a result of the Ingelfinger Rule, academic institutions have been put in the compromising position of having to either pay rising journal costs or lose access to research. Even efforts to make research OA, or free to read online, are having adverse affects on institutional budgets in the corporate journal system. Corporate publishers are putting limitations on Green OA, or the archiving of pre- and post-publication articles, and levying high article processing charges to make articles Gold OA, or free to read upon publication. Given corporate publishers’ profit incentives, so long as they remain in control of the academic journal market prices are likely to keep rising and crippling institutional budgets. Scholastica’s white paper argues that the only way to lower journal costs and enable OA is to break up the corporate publishing paradigm by making the knowledge and resources necessary to publish journals accessible to all. This will democratize journal publishing. Other industries have seen success with democratization. For example, in the financial technology industry robo advisors have made personal finance planning, once reserved for a select few, more widely available. In other industries affordable technologies and services are making democratization possible, and we argue it will be the same for journals. So what will service-based journal publishing look like? Will there be a predominant model? We argue no. Rather, we believe service-based publishing will foster a multiplicity of OA publishing approaches that give journal teams the ability to choose publishing and funding models that work best for their disciplines. A multiplicity of OA publishing models is necessary to introduce competition to the marketplace and prevent select groups from overtaking journal publishing, as in the case of the corporate model. The more journal publishing approaches that are introduced the greater the effect they will have on corporate control of the market and the more scholars will become aware of newfound choices of where to publish their articles. Service-based journal publishing will ultimately put control of journals back in the hands of the academic community. You can access the full white paper here. We hope this white paper will serve as a valuable contribution to ongoing dialogue about the future of OA publishing. We’d love to hear your thoughts! You can post in the comments section or tweet us at @scholasticahq.com. Can an ideal open access publishing model be determined in time to prevent more researchers from losing access to journals? Roxanne Missingham argues embracing a variety of publishing approaches is the answer. Elsevier's Acquisition of bepress: What comes next? What will Elsevier's acquisition of bepress mean for the journals and institutions that rely on Digital Commons to host open access content? We explore this question following the recent news.